New patients often remark how “relaxing” our office is. 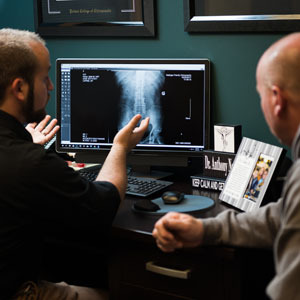 Here at Nafziger Family Chiropractic we realize that convenience and comfort are important when researching chiropractors in Archbold, that’s why it is our goal to offer state-of-the-art chiropractic care in a comfortable surrounding, and convenient location. We make your first visit as easy as possible and on average takes about 45 minutes. You’ll be greeted by name when you enter our chiropractic office and given a short tour to get you acquainted with our facilities. One of our staff members will explain your paperwork and allow you a few minutes to fill it out before you meet Dr. Nafziger. For your convenience you can also fill out your paperwork in the comfort of your own home and bring them in with you to your appointment, by downloading them from the right. After you meet Dr. Randy, you will immediately see why he’s different than most chiropractors in Archbold. 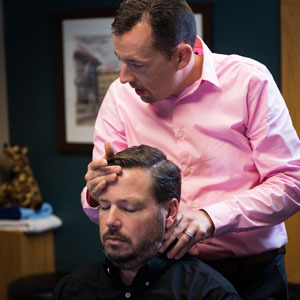 He will talk with you about your health concerns and take a detailed history of your health issues to help determine if yours is a chiropractic case. We like to think that we are good listeners… and we always encourage you to ask lots of questions. instrumentation - which involves running a nervoscope down your spine to locate areas of swelling. The nervoscope feels like two fingers gliding down your spine. It detects heat, which is an indication of swelling. These tests, in addition to others, help the doctor determine if yours is a chiropractic case… and if he can help you. To see is to know! Not to see is to guess. We do not want to guess when it comes to your health. In most cases, Dr. Randy will perform an initial spinal adjustment after reviewing the x-rays.